Successful businesses are nimble and built to scale. At times you might need to grow your sales capacity by bringing more people on board. Other times you might simply need them to get more active, boosting performance. Sometimes you need to do both. 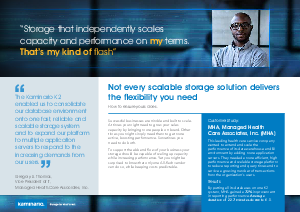 To support the ebb and flow of your business your storage should be capable of scaling up capacity while increasing performance. Yet you might be surprised to know that only one All-flash vendor can do so, while keeping costs predictable. Read on to learn about 3 scalabity benefits that will transform your storage purchasing experience.